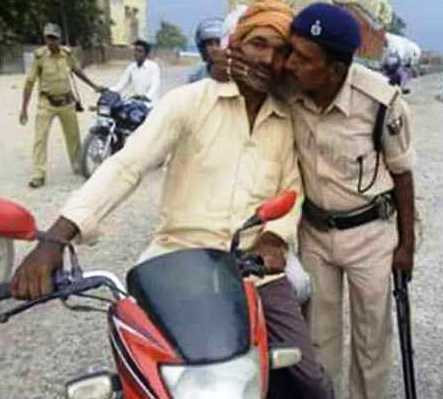 Wonderful Bihar: How ‘sniffer’ cops keep their state dry! PATNA: This is how police have gone in Bihar to ensure the state remains “dry”—a commitment made by chief minister Nitish Kumar. Bihar entered into the select list of “dry states” after the new excise law was unanimously passed from both Houses of the state legislature last month. Under the new law, consuming, storing or manufacturing liquor has been declared a serious offence yet there are reports of addicts stealthily sneaking into the neighbouring states in search of alcohol. Alarmed at such reports, the state government announced to punish those caught with “drinking smell” and have even arranged breathalyzers to police to identify such people. However, the police in the rural areas have taken to “traditional methods” to identify such drinkers with breathalyzers not available to them. Under this idea, they have gone on smelling mouths of the suspects, and the very photograph is a brilliant proof of this. So, the next time if you plan to travel outside to satiate your desire for alcohol, be alert or chances are that you may be pecked in public!